Monday Needlework Inspiration – Stumpwork! Today, I want to share a little stitching inspiration with you, to give you an idea of what you can do with the free embroidery patterns available here on Needle ‘n Thread! This particular piece comes by way of Peggy Kimball, who stitched up her interpretation of the embroidery design I shared with you here, using surface embroidery and stumpwork techniques. Peggy used supplies from her stash to stitch this piece. She started with surface embroidery on most of the flowers and leaves, and then decided to add stumpwork elements on the petals and leaves. She used what looks like a moire taffeta of sorts – she wasn’t sure what kind of fabric it is, exactly, as it was a leftover stash piece – as the ground fabric. For the embroidery, she used two strands of Anchor floss on all the elements, incorporating long & short stitch shading, satin stitch, stem stitch, and French knots in the embroidery. Peggy say that initially, the wire she used for the petals was too heavy. When she moved on to the leaves, she switched to a 33 gauge wire, which worked much better for her. She used two approaches to stumpwork. Some of the petals involve the buttonhole edge approach, and others are not edged with buttonhole over the wire. I really love the interpretation into stumpwork. The metamorphosis of the design – which started out as flat and two-dimensional – into a three-dimensional embroidered piece is a brilliant idea, and demonstrates quite well how we can interpret embroidery designs and make them uniquely our own. If you’re interested in stumpwork embroidery, there are different ways you can explore stumpwork from home. One of the best ways for beginners to get into stumpwork from the comfort and convenience of home is by taking Celeste Chalasani’s online stumpwork class, Stumpwork: Raised Embroidery Essentials, which is a Craftsy class that is worth its weight in gold! You can read my review of the class here, to find out what’s in it and how it will help you with your embroidery pursuits. Next best thing – and I’d probably pair the class and this book, if you’re serious about learning or you just want to have some fun dabbling – is the book A-Z of Stumpwork. It’s a terrific beginner (and beyond) guide, with step-by-step instructional photos. I’ve reviewed A-Z of Stumpwork thoroughly here, if you want more details on the book. You can find A-Z of Stumpwork here through Amazon (if you’re in the US), and through Book Depository here, if you want worldwide free shipping. Some Thread Talk!! Yay!! I’m trying out a new-to-me silk this week. It’s lovely! I’ll show you some close ups of it and talk about what it can do and how you can use it. I’ve started a new project. I’ll share some information about that, too. And reflect a bit on choices I’ve made with it. Behind the scenes, I’m working on an e-book that a few folks have requested. I hope to finish that up for you in the next couple weeks, if all goes as planned. I have company arriving from New Zealand mid-week, for a week’s visit, and that may throw my timing off a bit! I’m also back to working on a new section of Needle ‘n Thread, where I’ll share (for those who are interested and want to participate) my own projects, designs, instructions, and printables. I’m not ready to launch that section yet, but I’m building the content for it and working out the technical aspects. I’ll share peeks and bits as I work on it! Hope your week’s off to a terrific start! Today’s article contains some affiliate links for products or services, which means Needle ‘n Thread gets a small kickback if you happen to use those links. The use of affiliate links doesn’t alter my opinion in any way, but it does provide some sustainability for the website! Oooh, yes, it is a lovely interpretation of the design, isn’t it? I love raised work and there seem to be a number of new books etc around just now and/or coming up. There are some free photo tutorials for individual stumpwork elements on my blog too, such as wirework techniques, putting flowers and insects together and some raised stitches. Clicking on my name should take anyone interested to have a look see. Have spent many a happy time on your site, Elizabeth! 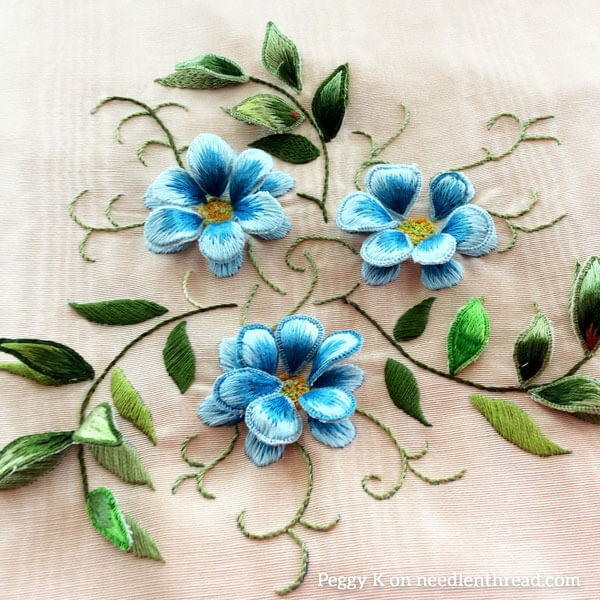 The stumpwork embroidery piece above by Peggy is absolutely beautiful and so detailed especially the raised petals they are stunning. A lovely piece of embroidery. I would like to ask what is the best wire to use and where to buy it in the UK. Thanks. Mary really looking forward to the future posts above your new project, and the e-book what is it? and the new Needle ‘n Thread section, it all sounds very exciting. Thanks for sharing Peggy’s stumpwork project with us and for the related links look forward to the up and coming posts. Anita – I am also in the UK and tend to use a paper covered florist/sugarcraft wire which is readily available online, normally in white or green. Just search for ‘paper covered florist wire’ or ‘paper covered wire sugarcraft’. It is sold in different gauges, in the UK the higher the gauge number the thinner the wire. I’m not sure how the sizing works elsewhere in the world but for medium sized petals/leaves,I use what is gauge 28 in the UK. Smaller petals/leaves would need something higher. As it is often labeled as being for sugarcraft flowers, you may well find it at cake decorating suppliers, but it works perfectly well in embroidery. Mary, thanks for sharing Peggy’s beautiful work. thanks so much for the information on wire for stumpwork that is very useful information. I shall go ahead and search for your recommendations. Florists’ or cake decorating wire should work. Gauges 28 upwards. I got mine from Surbiton Sugar Art. Wow, I just found you and can I say I love your website, so much information, Thank you so much. I have dabbled in stumpwork and enjoyed it, I will need to check out your recommendations in learning more. That’s a lovely version of the design, and really sets the mind thinking! I love Stumpwork, though still very poor at it. I think I improve a bit with each try, so that’s what matters! Just as a word of warning about the Stumpwork class you mention above. I don’t believe its for total beginners. I have been embroidering for about a year and have taken that class and found that the class isn’t always clear if you’re not sure about what you’re doing and I at least understand the stitches involved. My sister who doesn’t embroider took a look at it and found it way too difficult. In saying that I have stumbled through and am nearly finished the poppy project. It certainly is a beautiful project. Sorry for the negative comments. Your comments don’t seem negative, just thoughtful and useful for anyone considering the class. Dear Mary, Thank you for sharing this lovely piece with us & congratulations to Peggy! Previous Previous post: Needlework News Snips & Goldwork Book Winner!